Why DNN Campaign Monitor Add-on? DNN Campaign Monitor Add-on is an Action Form extension that adds functionality into Action Form generated forms to automatically submit subscribers to a predetermined list within a Campaign Monitor client account. Simply copy and paste your Campaign Monitor API Key into the module admin settings and it will pull in your Campaign Monitor list at a glance. With DNN Campaign Monitor Add-on there is no requirement for setup time. Installation is a snap. Simply download and install it and you are good to go! DNN Campaign Monitor Add-on is built to work right out of the box and is tightly integrated with Action Form (v. 05.00.00+) so you don't have to worry about conflicts or core upgrades later. Action Form provides the form configuration and processing functionality necessary for DNN Campaign Monitor Add-on to work. Just input your Campaign Monitor API key and your List Name and you are ready to start. DNN Campaign Monitor Add-on can collect and add subscribers to your email marketing lists automatically in complex workflows. If you need a simple signup form for your Campaign Monitor account, then DNN Campaign Monitor Add-on is your ticket. This option allows you to select which data to pass to Campaign Monitor by mapping a field name to the Campaign Monitor list fields. You can write a condition that will determine at submit time either the Subscribe to Campaign Monitor action will get executed or not. 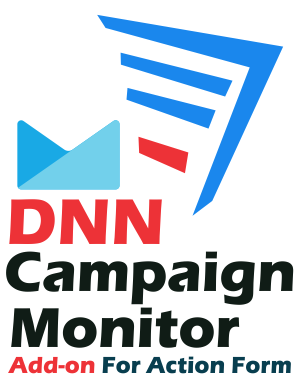 DNN Campaign Monitor got your back. The template available is responsive which means it will self-adapt to the device your visitor is using. You have the option to manually select the email field in the form should be used to subscribe to Campaign Monitor. DNN Campaign Monitor Add-on is built to work right out of the box and is tightly integrated with Action Form (v. 03.03.02+) so you don't have to worry about conflicts or core upgrades later.